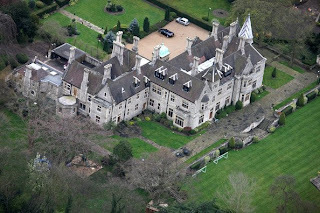 I keep hearing on TV about Michael Jackson's parents compound. And I'm wondering when does a house become a compound? 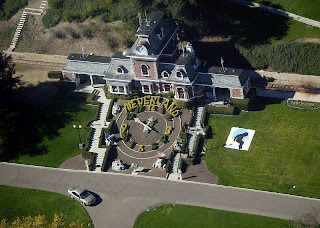 In my mind, I think of Neverland as a compound. 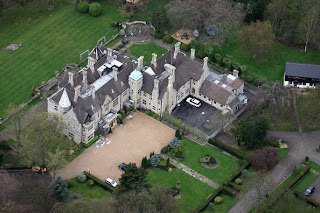 Does Michael Jackson's parents live in a bigger place than Michael? This is the question that's been on my mind the past couple of day..
Red, White & Blue Swap Has Arrived! White chip clips and red candles..
Love the saying on this hand towel..
Red postcard, I think I could frame it, it's that nice! And it continues, a patriotic oven mitt and red spatula..
Juanita - Thank you so much! TGIF and I do mean TGIF! Spray bottom and sides of 13x9-inch pan with baking spray with flour. In medium bowl, stir brownie mix, pouch of chocolate syrup, water, oil and eggs until well blended. Spread 1/2 of batter (about 1 1/2 cups) in pan. Bake 15 minutes. While that's baking, in large microwavable bowl, microwave caramels and cool whip uncovered on High 2 to 3 minutes, stirring occasionally, until smooth. Pour caramel over partially baked brownie; spread to edges. Sprinkle with 1 cup of the chocolate chunks and 1/2 cup of the pecans. Drop remaining brownie batter by spoonfuls onto caramel layer. Sprinkle with remaining chocolate chunks and pecans. Bake 33 to 36 minutes longer or until center is almost set. Cool 1 hour at room temperature. Cover; refrigerate 1 hour before serving. At my place of employment, we have a full service cafeteria and on Monday, they served pizzadilla's for the first time. I've found another way to eat pizza at home without spending a lot of money. So I thought I'd share the recipe, it's very simple and so yummy! For each quesadilla, start with 1 soft taco size flour tortilla. Place the filling ingredients on half of each tortilla, leaving a 1-inch border around the edge. 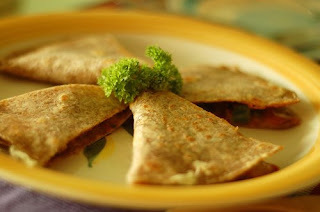 Fold tortilla in half over filling. Cook for about 2 to 3 minutes on each side or until tortilla is crispy. (Remember, the quesadillas will cook faster if the skillet is already hot!) Remove from the skillet and let cool for a minute or so. Cut into wedges to serve. Serve with pizza sauce for dipping. Last week at work, I let it slip that I go to Goodwill every Saturday and Sunday. Immediately they wrinkled their noses and said Goodwill stores don't smell good. I just listened to them and then they stopped talking and wanted to know what would cause me to go there two times every weekend? Did I get my clothes there? What was it? I've bought some clothes from Goodwill but for the most part, I stick with home decor and books. There's something about wearing somebody else's shoes that gross me out..and why they sell bra's - that's just disgusting. I bought a brand new bottle of Bath and Body Works lotion for $1. I showed them at work and one gal said that someone might have peed in it. I pretended to rub it all over my face and she was grossed out. Too funny! I jokingly told them I would be looking for something for them each time I visit Goodwill. On, Sunday I found this cute wooden box for a gal that loves Mickey Mouse. I got it cleaned up and going to give it to her today. Are you living a secret life? Happy Monday - it's that time again to check out Between Naps on a Porch & Metamporphis Monday and Southern Hospitality & Today's Thrifty Treasures. Please be sure to check out both blogs for more fun makeovers and thrifty finds! 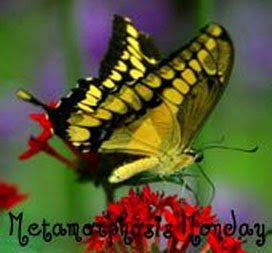 I'll start with my metamorphis above my kitchen cabinets. I've always had lots of things up there and struggled to figure out how to show my things. I thought I had a before picture but I couldn't find it. But trust me - it was full! Here's what it looks like now and everything is from thrifting or Ebay. I love the decals that are so popular right now..
Now onto the Thrifty Treasures - I visit Goodwill every Saturday and Sunday and of course, this weekend was the same as every other weekend. More red, white and blue! I can't believe that I found these when the 4th if so close! Cute little angel, going outside on my covered deck. I meant to put it in the laundry room but these corn muffins sure look good in there! Do you like to go camping? Whether it's rain or shine, there's always some element that I don't enjoy. 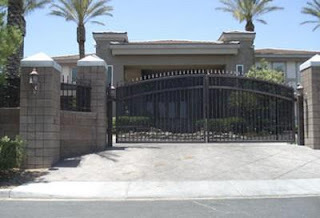 Whether it be walking one mile to go to the bathroom let alone take a community shower, the bugs, smelling like a bonfire 24/7, up late because the neighbor next door is partying all night. I've done some camping - oh yeah - sleeping on the ground - that's the top of my all time camping favorites. 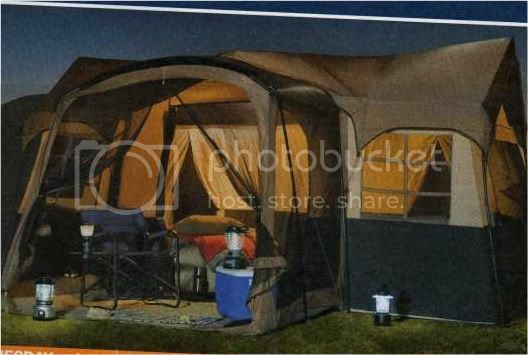 Well today in the nedwspaper ads, K-Mart has some great pictures selling their tents. How I wish that my camping experience could compare to the ads. Could it be possible that maybe we did something wrong when we went camping? I think my sisters tent blew down in the night when it poured, and they were so much fun in the morning. Does your tent look like any of these pictures? And camping in a motorhome, is not camping. You can camp your way and click here to see my idea of camping! Every spring, we put our house plants outside for the summer and they flourish. I'd never put a house plant in the direct sun for fear that it would burn up unless its one of my cactus's. Pretty sad, isn't it? I'll have to post a picture in Sept/Oct and show (cross my fingers) what it transformed into. My DH rolls his eyes when I mention that someone needs to trim up their landscaping. What's with the people that never maintain their landscaping and it becomes a jungle? Anyway, cross your fingers that I didn't do more damage than this plant can handle. I wonder, the plant and I have been together for 20+ years and I haven't named it...any ideas? I'm thinking it must be a female plant - it's hardy and never gives up. Yesterday, I decided to change my header picture and the background. I can't seem to figure out how to make my header picture fit across the entire length of the header. Anybody have any ideas? I've spent too much time trying to figure it out and no closer to getting it fixed than when I started. How did everyone learn how to make their blogs so nice? Don't you just love to go thrifting and see what you can find? This weekend my oldest daughter came home and we went thrifting and spent time together. The weather has been rainy, cold and windy - very unusual for June and not so good for rummaging. But we found that there were still some good finds out there. The first rummage we went to, I got a Dooney & Burke backpack for $5. I got it for my youngest daughter and she quickly snatched it up so I don't have a picture. Another rummage I found a Kathy Van Zeeland wallet that was still in the box with the tag - $5! Then we ran into a bunch of lousy rummages and decided to vist Goodwill. I don't think we found anything there either and headed for home. Not to be discouraged, we headed to the very same Goodwill on Saturday morning and we scored some great finds.. This cute pink plate - it also came with a bowl and coffee cup for $6 and I asked what would just the plate cost and they sold it to me for $1! And then I found this dragonfly cloche - $5! I've also been redoing the area above the kitchen cupboards and I had an area that was open and needed something.I found this red plate rack and plate - how perfect is this! I'm pretty sure it's a Homemaker Ideas basket that sells for $50 or more and I got it for $10, still alot of money but much cheaper than buying new. I'm not sure what the brand is but it reminds me of something you'd find at Pier One and we grabbed that too. The gal said that they just put both of them out and and not even five minutes someone is paying for them. 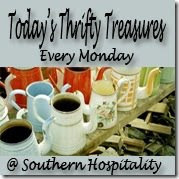 Stop over and visit Rhoda at Southern Hospitality and check out all the other thrify finds! Time for Thrifty Treasures & Goodwill Party!